Victoria Toon, Chartered Accountant, incorporated Corporate Restructuring Limited “CRL” in 2009. CRL has earned an enviable reputation for consistently achieving results that makes us one of New Zealand’s premier boutique insolvency firms. Our success stems from a combination of astute business skills, friendly, motivated, educated staff, and a genuine empathy and commitment to the people we deal with. At CRL we are committed to achieving the best possible result first and foremost for creditors, especially employees. We are sensitive to the distress that directors and shareholders suffer when making the decision to liquidate an insolvent company. Directors frequently tell us that the decision to liquidate was one of the best decisions they made; like “ripping off a band-aid”, the initial decision might have been difficult but the process of resuming their lives was then able to begin. Our team endeavours to make this process seamless for all parties involved. As well as insolvency, Victoria is well known within Auckland chartered accountancy circles as being the doyenne of solvent liquidations. Solvent liquidations are her specialty and few others in Auckland have her depth of knowledge for this unique area. Many accountants attempt solvent liquidations, believing them to be easy but then strike difficulties. To do it right – and avoid any unnecessary IRD entanglements – contact Victoria. Victoria is a Chartered Accountant specialising in the field of insolvency and company re-organisations. She is an accredited member of RITANZ, the professional body for insolvency practitioners. Victoria is the Chair of Chartered Accountants Australia & NZ “CAANZ” Auckland Public Practice Special Interest Group where Auckland Chartered Accountants meet monthly to discuss and extend their professional knowledge. She has held this role since 2011. Victoria was a member of the NZ Institute of Chartered Accountants Auckland Branch Committee from 2003 – Oct 2009, the last two years as Chair. Victoria regularly presents on insolvency, solvency, PPSR and related taxation issues to members of the Institute. In her spare time, Victoria enjoys gardening, watching cricket and rugby, and spending time with her four grandchildren. 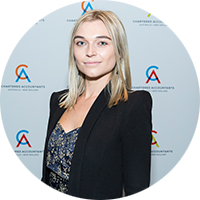 Annabelle joined CRL in 2013 and gained her Chartered Accountant qualification in July 2017. Annabelle is also a member of RITANZ . Annabelle oversees most of our solvent liquidations and large insolvency jobs. In her spare time, you can find Annabelle on the netball court or watching her favourite rugby league team, the Warriors. Jessica has worked for CRL since the beginning but now works part time as she has two young sons, Tom and Ted. Jessica has moved into an administrative role for mostly insolvent liquidations. In her spare time, Jessica enjoys gardening, baking, spending time with her husband David and their children. Zak is a key member of our team. Frequently found to be asleep at Jessica’s feet, he is the happy face who will greet you at the door. He works very hard, as illustrated by the amount of sleep he requires each day.